Sony Xperia L2 review: no, no, no! After unboxing the Xperia L2 and spending a trial period with it, I'm ready to give a verdict on the new entry-level Sony smartphone. Is it an enticing device? Is it worth the price? Find out in our full review. The Sony Xperia L2 was released on February 16 in the US, and is available from Best Buy for $249. It comes in black, gold and pink. For this review, I tested the black model. The design of the Xperia L2 doesn't deviate from the classic, iconic lines of Sony's Omnibalance design. The smartphone has a plastic frame and back. But don't expect a nice polished glass-like polycarbonate, it's a plain plastic that feels anything but premium in the palm of your hand. As soon as I began testing the device, I immediately noticed that if you press on the back of the device, the thin plastic bends inwards until it touches the non-removable battery inside. The curvature of the back of the device makes it a bit more ergonomic, but it leaves an empty space above the battery. The smartphone is also large for a 5.5-inch device, which is especially noticeable when you hold it in your hand due to the huge bezels. The old school, 16:9 design combined with these large bezels make the L2 really unwieldy. In spite of this, the fingerprint reader is positioned so that it can be easily reached with the index finger. Though, it's a pity that it is one of the slowest scanners I've had the opportunity to test for a long time. The 5.5-inch IPS display is protected with Gorilla Glass 4. The panel only has HD resolution, which is disappointing given the price of this device. As you'll find out as you read on, this isn't the only spec that doesn't live up to the price tag. I found the display's brightness to be inadequate, particularly in the sun. The fact that the light sensor is slow to detect ambient light and make adjustments did not help. Overall, the colors are perfectly fine, even if the blacks aren't as deep as you might find on an OLED panel. The viewing angles of the display are good, and none of the blacks turned to gray as often happens with LCD panels in this range. 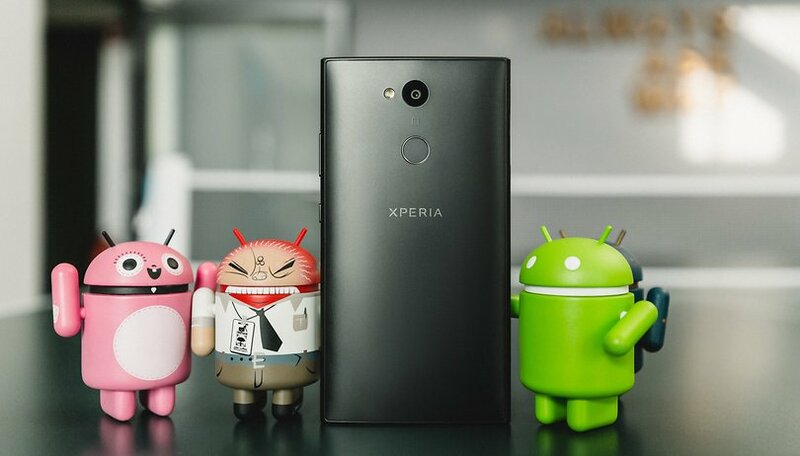 Despite the fact that the Xperia L2 was presented in January 2018, the device comes with Android 7.1.1 Nougat and a security patch as old as November 2017. This wasn't a great move on Sony's part, but this may have been the fault of the MediaTek SoC. As we know, the company's other devices presented from IFA onwards already have Android Oreo. Even the Xperia XA2 and XA2 Ultra run Android 8.0 Oreo, and they were launched at the same time as the L2 at CES. As for the rest, the software is classic for Sony: lean, fast and clean. It's too bad the hardware can't keep up. The processor of Xperia L2 is really disappointing. A Snapdragon 400 series would definitely have been a better choice than the 1.5GHZ quad-core Mediatek MT6737T with ARM Cortex-A53 architecture. The 3 GB of RAM is more than enough, but the smartphone's CPU cannot keep up with basic software functions like homescreen animations or switching between the various open apps. Performance when scrolling content such as simple PDFs or system settings is good, but don't try to go too fast while browsing your Facebook or your Instagram feed. The 32 GB of eMMC internal memory is more than enough and can be expanded with a MicroSD card. The audio experience using the Xperia L2 with headphones is fine. The smartphone still has the much-loved 3.5 mm headphone jack and features some small software goodies already found on other Sony smartphones like ClearAudio+, the equalizer and a function that normalizes audio between tracks to avoid sudden, jarring changes in volume. There is the AptX Bluetooth audio codec, but no AptXHD or LDAC as usually present in the latest smartphones of the Japanese company. Don't expect any miracles from the speaker, as the volume doesn't get very loud and the quality is uneven. The sound is flat and lacks bass, plus there's distortion at high volumes. In addition, the position of the speaker on the bottom of the phone makes it easy to cover if you're holding the device horizontally to watch a video, for example. The main camera is 13 MP and has a size of 1/3.1". The lens has an aperture of f/2.0, but it's not the best on the market. The Xperia L2 is capable to shooting video at 1080p and 30 fps, which is enough for social media and sporadic use. The front camera is 8 MP and it has an aperture of f/2.4. The camera takes shots that are just passable for Snapchat or quick texts to a friend, but nothing more than that. The photos lack detail, and even in excellent lighting conditions, the results come out dark. Autofocus is quick, but don't expect to be able to catch fast-moving subjects. The 3,300 mAh battery is huge given that the Xperia L2 has a dim, low resolution screen and a weak CPU. You can safely go two days without charging, perhaps due in part to the fact that the phone's performance doesn't inspire a lot of use. With moderate use and activating airplane mode at night, it's possible to have a long weekend without bringing a charger along. In our test with the PCMark Battery Work 2.0 benchmark, the smartphone lasted 9 hours and 34 minutes - far surpassing smartphones like the OnePlus 5T (5:45) and the Sony Xperia XZ Premium (7:05). Charging is done using USB Type-C, but there is no fast charging and the port is USB 2.0, so data transfer to and from a PC is less than optimal. My primary criticism of the smartphone is its excessive price. Entry-level smartphones like this can satisfy many users and perform basic functions without batting an eye, but the Sony Xperia L2 is priced like a mid-range smartphone so we have to evaluate it like one. For $249 or even less, there are many alternatives, like the Honor 7X, whose build quality and specs are far superior. If the Xperia L2 were to drop below $180, it could be a good choice for users with few demands and a small budget. As things stand right now though, it would be crazy to buy a smartphone with these specs for such a high price. lol i've never seen anyone run a test like this on the screen of an entry-level phone. in fact, i've never seen any reviewer do that for any device. it's usually sufficient to state, "the colors look good/bad". article is confusing. what warranted a review on this device? You are the laughing stock of the internet, thankfully your readers aren't as dumb. The L2 hits a great sweet spot for the price! Your review of this phone is like you're reviewing a $700 phone. Yes I see the short comings you mentioned but 250? Really? You compare it to the honor 7x which lacks NFC and is probably filled with China spyware. It also probably has some kind of wack tempered glass like honor phones off the past. But yes I wouldn't buy a phones under 400 bucks anyway. Oh and HD is fine. The pixel resolution is beyond the eye's ability to pick out without magnification and the material reviewing for the most part isn't 2K or 4K so it's not a particular issue. You've been deceived by the Numbers race. This idea the plastic "feels" bad and so affects quality is a stupid idea that is not reflective of reality. It's strong it's tough It's durable and it happens to be inexpensive. I don't know but that sure sounds premium to me. Quality isn't about feel, quality is about performance. And plastic outperforms aluminum and glass for phone backs in every single way that you can measure. Your subjective joy in glass and aluminum is not a sign of quality but just of what you like. When you measure the kind of wear and abuse it can take and still look good, plastic wins. Similarly dinging and noisy vibration motor. do you understand what sound is. Sound is vibration. you can't make a vibration motor that is quiet. If you wanted to get quantitative about it then you should be measuring decibels on every phone making a real measurement not just an opinion.